Elizabeth Banks Portrays Effie In "The Hunger Games"
You might have to squint at Effie Trinket in “The Hunger Games” to spot Elizabeth Banks under the layers of confection-colored costuming, but she’s in there. An unabashed fan of the Suzanne Collins’ novels from which the film is derived, Banks tells PopcornBiz she was more than willing to endure a little claustrophobia to bring the relentlessly upbeat but empty-hearted Effie to life on the big screen, and she reveals just where she drew the line when it came to compromising her own dignity for fame. Can you still see yourself underneath Effie? A little. I see little things every once in a while, but I'm pretty proud how far away from myself I went. Was it claustrophobic to have all of that layered over you? Oh, my God, I got out of that thing as fast as possible! At all moments that I could be out of it, I was out of it. I got heat exhaustion my third day of filming, which I'd never had before and I don't recommend it to anyone. It wasn't claustrophobic. It was very uncomfortable and purposefully so. I wanted her clothes to be oppressive. I mean, she's horrible. She's not a good person. She's very vain and selfish and I really wanted the costume to work on me as an actress and it did. It was a great part of the job that I was doing, being restricted and oppressed and hot and uncomfortable and just being constantly reminded that that's what I live under. How did you go about transforming yourself into someone so eccentric? Well, Suzanne [Collins] wrote her with pink hair and crazy outfits. So, we looked at that. That was our first inspiration. Gary [Ross] said, 'I just imagine her face like Joel Grey in "Caberet."' So, that was one thing. We also wanted her to be ageless. I have this sense that in the Capital they use this use this crazy, weird plastic surgery and f***ed-up s**t. So I wanted it to be like, 'Is she 20 or a 110?' Once we had the look established, it was about two and a half hours of makeup every day, which is not that bad, I guess. Is the look you guys came up with anywhere near the look you pictured when you were reading the book? In all honesty, I didn't picture so much the way that Effie looked as the way that she carried herself. The attitude is what I feel I nailed. The way that I imagined her attitude is what I wanted to get out in the movie and I feel like I did that. Do you relish having an opportunity to have a costume and makeup and voice like that because you don't get to do that all that often? Yeah, of course. It's so much fun to watch yourself disappear everyday and have Effie appear. I really was not Effie unless it was on. I would have that aha moment where she came together for me everyday. Sometimes it was the lip. Sometimes it was the hat. Sometimes it wasn't until I was walking, like, 'Oh, here's Effie.' She lived somewhere in there and I had to sort of find her every day. 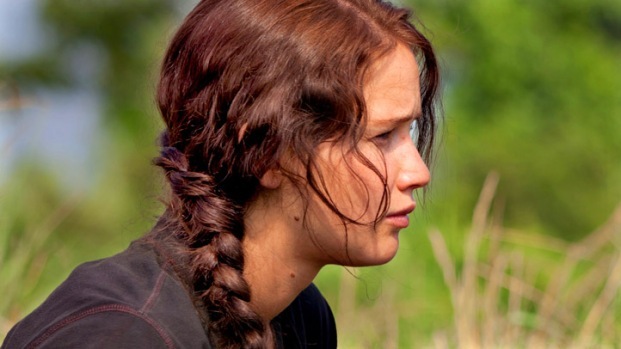 What was everyone's entry point into 'The Hunger Games'? Were you a fan of the book or did you learn about it when you got the script? I'm a total nerd. I had read all three books long before the movie. I was just a huge fan of the writing. I read the first book really early on, before it was a bestseller. I don't own it because I gave it to my sister and I gave another one to my mother. My whole family had read it, and then I actually had to be on the waiting list for 'Mockingjay' on Amazon for two months. How did you come across it to begin with? Is it a genre that you're really interested in? Yeah. I read a similarly themed book called 'The Maze Runner,' which is a great book, and a friend said, 'If you liked that book, you'll really like this one.' I have a production company and we're always looking at material to buy, and we went very far down the road with 'Maze Runner,' which is actually being made. They're working on a script right now for Catherine Hardwicke to direct. We ultimately ended up not partnering with this other company to do it. So 'Maze Runner’ was a great book and someone said, 'If you like that you should read "Hunger Games,"' and of course by the time that I read it Nina Jacobson had it already. Since you were fan of the books what was it like when you got the role of Effie? I mean, I did a little dance. I was in Gary Ross' office. He brought me in to show me all the references and he was sort of torturing me because he didn't say that I was doing it until like an hour of us hanging out in his office. He was like, 'Why did you think I brought you down here? I wasn't wasting your time.' So I did a little dance. I was really excited. I loved her. I had a lot of ideas about her, and Gary and I had a really great dialogue about it. It was really fun. Was there something that you read in the novel or the screenplay that you went, 'Now I get who this person is'? For me, I can't remember the exact quote, but Effie says something to Katniss, she slaps her hand and goes, 'You're driving me crazy!' or something. I can't stand teenage girls, like I want to beat them. I want to beat them all. I can't believe that I ever was one. They're horrible. They're so self-involved and they all hate their mothers. I was there. I was the exact same. There's no judgment. It's just a horrible time in someone's life and they don't know it's horrible. They think it's great, but they're all being such little…anyways. So, I just had that feeling of like, 'Wow. I'm there now. That's how I feel about teenage girls,' and if I was Effie and this Katniss girl showed up and she was giving me grief I'd be really pissed. Was there a moment in your career where you realized dignity is more important than fame? I remember being offered a movie and it was like, 'Listen, you'll be naked in this bathtub and they'll slash your throat. It's going to be awesome.' I was like, 'Goodbye.' That was like audition number four or something, like, 'Yeah. I'm good. No, let's not do that.' 'But Mario Van Peebles is going to be in it.' 'Okay. Thanks though.' I love Mario, great guy. It's just that one was not for me.